He didn't find neither the map nor the key. Neither is paired with nor and either is paired with or. You cannot mix them, but often the word either is omitted. Either the clerk or the secretary has the keys to the Rover. Read more about using a singular or plural verb with Either/Or and Neither/Nor. The clerk or the secretary has the keys to the Rover. He did not find the key either on or under the mat. Neither the forwards nor the scrumhalf, all of whom were within 10 metres of the tackle, nor the crowd appealed for a foul. The pairing neither/nor plays a negative role in the sentence. Be careful not to use a double negative. Adam did not find the key neither on nor under the mat. He did not mention neither the flooding nor the landslide. He mentioned neither the flooding nor the landslide. He did not mention either the flooding or the landslide. I haven't got no money. What are conjunctions? 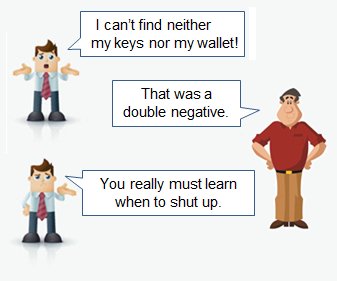 What are double negatives? Either/or plural or singular verb? Take another test on the difference between either and neither. The pairings either/or and neither/nor are known as correlative conjunctions. You cannot mix them. In other words, either cannot pair with nor, and neither cannot pair with or. David did not see no car. Remember, two negatives make a positive. The examples above are not grammatically incorrect, but they probably do not mean what the originator intended. My kids don't believe in no Santa Clause. Read more about correlative conjunctions.